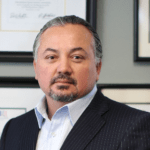 The Aging Process… Chronological Aging versus Biological Aging. Can you reverse the aging process? None of us like getting old. The process of aging is annoying, uncomfortable, and it just plain hurts. New research on aging shows that regardless of how old you are, you can greatly improve or reverse the aging process. Let’s begin with some definitions. What is chronological aging and what is biological aging? Chronological Age is measured by earth revolutions around the sun. This is the one we’re all most familiar with. Because it’s easy and familiar, everyone has a chronological age. Many tests and programs are based around it. Is this really a good measure of age in a technologically evolving world? Biological aging can be reversed with specific exercise & nutrition. Biological Age is defined as an individual’s development based on biomarkers. A biomarker is a recordable molecular or cellular event. Here we’re looking at the individuals as they are, not necessarily when they were born. This is biological aging. Humans, in most cases, follow the same biological path. For example, the easiest one that comes to mind is the beginning of puberty. More complicated ones exist, such as increases and decreases in human growth hormone, myelination events in the brain, and the degradation of certain tissues as you get older. 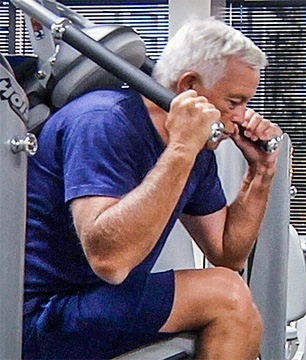 The great news is, we can significantly slow or even reverse biological aging through a combination of specific exercise, nutrition, and lifestyle. But what is the combination that will deliver the optimum results? 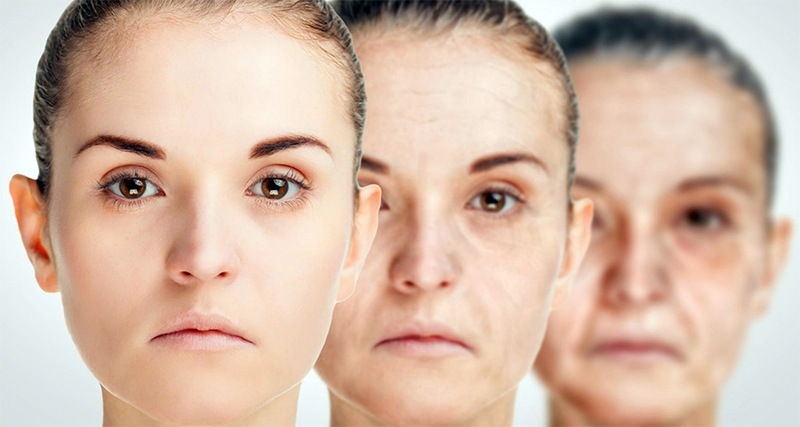 Can we reverse the aging process by 10, 20, 30 or more biological years? Again, the answer is YES. In the fight against aging, most of us need all the help we can get. Little do we know that there are many factors that can contribute to aging that we can work to control. The following are the five theories anti-aging experts attribute to its causes, amplification and prevention. Inflammation The activation of the immune system—due to an infection, allergen or toxin—leads to internal inflammation at the cellular level. Poor nutrition, too little sleep, and radiation are common culprits of low-grade inflammation, which has been linked to arthritis, cancer, Alzheimer’s disease and heart disease. Lifestyle What we eat (too much sugar, fat and sodium), drink (too much soda, juice, etc. ), do (get overstressed, work too much), don’t do (exercise or sleep enough), and what we expose ourselves to can speed up the aging process and the development of chronic diseases. Hormones Levels of estrogen, progesterone, testosterone, DHEA, thyroid and/or human growth hormone drop as we age. But by increasing these all-important biochemicals, it may be possible to improve health and forestall the aging process. A controversial approach, hormone therapy, requires oversight by an experienced physician. Antioxidants Call it the “rusting” theory. As we get older, we’re subject to oxidative stress, the byproduct of free-radical damage, a natural process in which unstable molecules disrupt cell and tissue functioning. Antioxidants such as vitamins A, C, and E, glutathione and alpha lipoic acid can help protect cells. Detoxification When the body can’t rid itself of toxins, including high amounts of sugar, trans fat, mercury and chemicals we ingest from our food, its equilibrium is impaired, leading to fatigue, poor skin, heart disease, cancer and more. Detoxification and inflammation are closely linked. A groundbreaking study called the New Zealand Longitudinal Study of Aging confirms people age at different rates. It turns out your chronological age is just a number! More importantly, your biological age can reveal a great deal about your general health and the rate at which you are aging. This study was different than other research on aging. The scientists’ objective was to reveal more about the aging process in younger people, and therefore provide a foundation for devising preventative therapies for age-related diseases. During this research on aging nearly 1,000 subjects born in New Zealand in 1972 and 1973 were measured for 18 different biological markers over a period of almost 40 years. Each marker is a piece of the aging puzzle. The ‘health’ of each participant’s pulmonary, periodontal, cardiovascular, renal, hepatic, and immune systems were assessed using these biomarkers. With these results, researchers calculated a biological age for each participant and then compared the changes in these measurements over time, yielding a quantified pace of aging. The majority of the research on aging participants had biological ages similar to their chronological age. But here is the important part. Some participants were found to have aged as much as 3 years physiologically over the course of just one calendar year. Scientists also found participants with an accelerated rate of aging performed worse on physical and cognitive ability assessments. The common saying, “you’re as old (or young) as you feel,” was confirmed by the study’s results. Participants with an older biological age perceived themselves to be in worse health than their biologically younger peers. A big challenge in assessing aging are the compound results caused by cumulative life experiences. For doctors and scientists, it’s nearly impossible to determine whether lifestyle, stress, medical history, or other circumstances are individually responsible for many age-related diseases. Ultimately, it’s a combination of all these factors that either ages you prematurely or keeps you healthy and prevents illnesses now and in the future. This is precisely why so many biomarkers were used in the study and why multiple beneficial lifestyle choices typically have a synergistic effect on your overall health. This study will have significant implications on further research to prevent aging, which will help us not only increase our lifespans, but more importantly, increase our health span, or “the years of life lived without disease and disability.” Living longer doesn’t help us much if we’re too sick to fully enjoy the extra years we have. Making proactive decisions about your health now can have lasting positive effects this new research on aging shows. This is all good news, but it’s just the beginning. Most people are either too lazy or not worried enough to change their behavior and routine. In my next article, I’ll be talking about the most common major age-related health issues. I can’t thank you enough for providing me with the support and training that has given me improved health, energy, focus and most importantly the knowledge that I can reverse the effects of middle age. 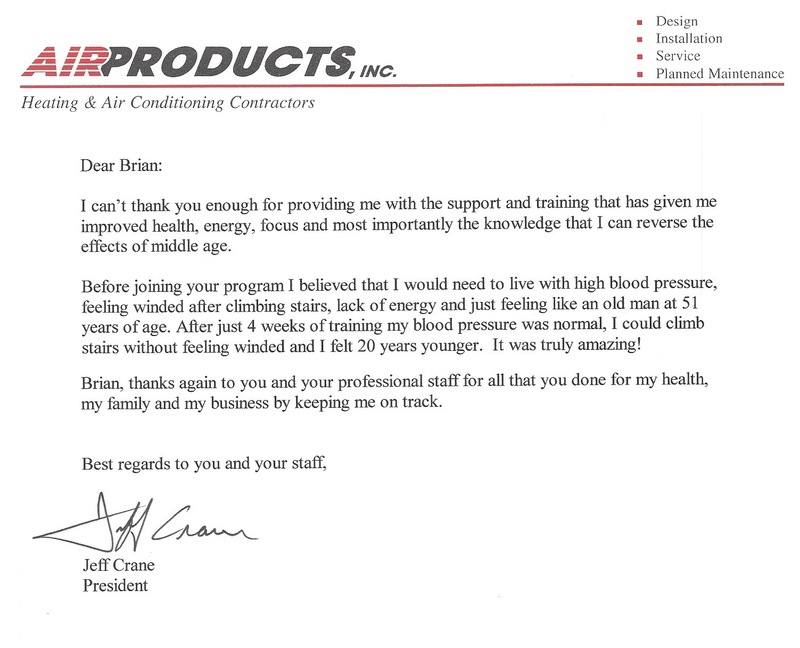 Before joining your program I believed that I would need to live with high blood pressure, feeling winded after climbing stairs, lack of energy and just feeling like an old man at 51 years of age. After just 4 weeks of training my blood pressure was normal, I could climb stairs without feeling winded and I felt 20 years younger. It was truly amazing! 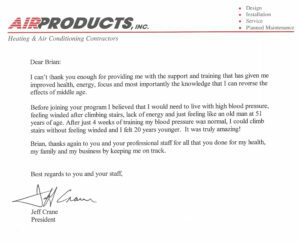 Brian, thanks again to you and your professional staff for all that you done for my health, my family and my business by keeping me on track. Thank you for the gift of new life. 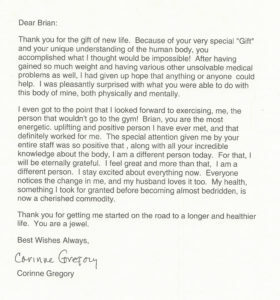 Because of your very special "Gift" and your unique understanding of the human body, you accomplished what I thought would be impossible! After having gained so much weight and having various other unsolvable medical problems as well. I had given up hope that anything or anyone could help. I was pleasantly surprised with what you were able to do with this body of mine, both physically and mentally. I even got to the point that I looked forward to exercising, me, the person that wouldn't go to the gym! Brian, you are the most energetic. uplifting and positive person I have ever met, and that definitely worked for me. The special attention given me by your entire staff was so positive that , along with all your incredible knowledge about the body, I am a different person today. For that, I will be eternally grateful. I feel great and more than that. I am a different person. I stay excited about everything now. Everyone notices the change in me, and my husband loves it too. My health, something I took for granted before becoming almost bedridden, is now a cherished commodity. 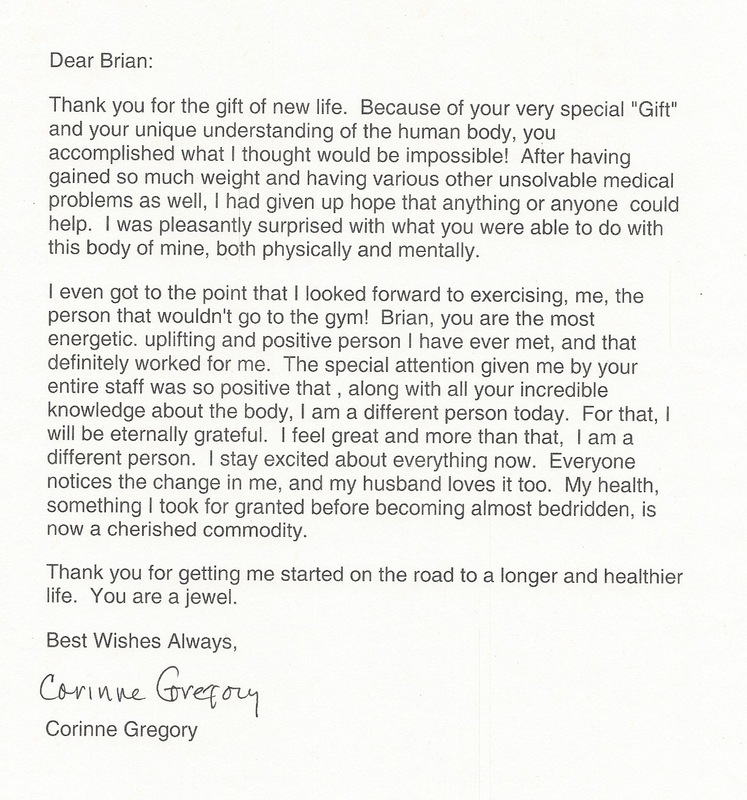 Thank you for getting me started on the road to a longer and healthier life. You are a jewel. If this makes sense to you and you are ready to reverse the aging process, reach out to me, today. 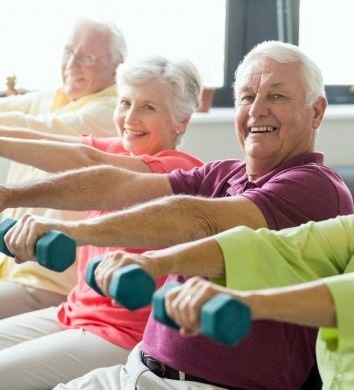 We can schedule a no obligation consultation to review your current biological age and recommend a health and wellnees program for you.